Huge reduction, priced to sell! 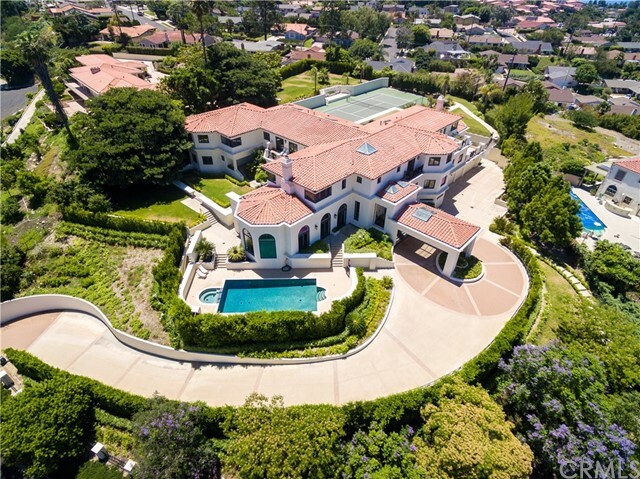 Majestically situated atop of Palos Verdes Estates highest points, this extraordinary private gated estate overlooks a breathtaking panoramic ocean, city and Queen’s Necklace view. Built on approx 1.45 acres and renovated in 2015, this home is perfect for living & entertaining, encompassing 18,277 sq. ft. of luxurious living space. Drive through the gate and up the long driveway to the grand motor court with ample guest parking. Step inside and feel the open, spacious floor plan with the beautiful marble entry, high ceilings & abundance of natural light. This amazing home boasts 7 bedrooms, 11 baths, and has been beautifully updated with elegant oak wood floors, carpet, trim and greenery. Entertain your friends and guests with your private two lane bowling alley, or a night at the movies with the fully equipped home theater. French doors throughout open to multiple patios & balconies with beautiful sconce lighting, creating an easy indoor/outdoor lifestyle. Enjoy the newly redone regulation sized Tennis Court with viewing pavilion, large pool & spa, and beautiful new landscaping, complete with custom planters. Other grand features include a gym, office, maid’s quarters & laundry facility, dumbwaiter, sauna, 5-car garage. Welcome home. Available for lease as well.